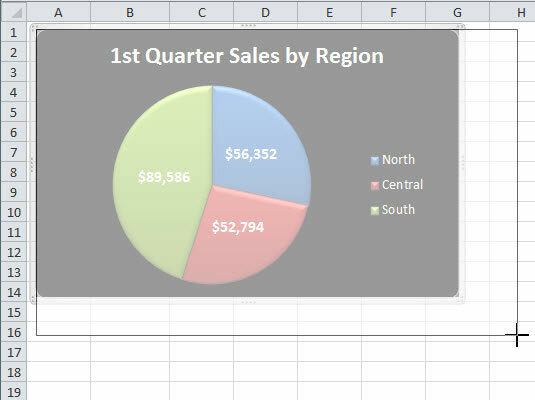 After you create a new chart in an Excel 2010 worksheet, you can easily move or resize the embedded chart. Whenever an embedded chart is selected (as it automatically is immediately after creating it or after clicking any part of it), the Chart Tools contextual tab with its Design, Layout, and Format tabs appears on the Ribbon, and Excel outlines each group of cells represented in the selected chart in a different color in the worksheet. You can always tell when a graphic object, such as a chart, is selected because you see selection handles — those tiny dots — around the edges of the object. To move the chart, position the mouse pointer somewhere inside the chart and drag the chart to a new location. To resize the chart, position the mouse pointer on one of the selection handles. When the pointer changes from the arrowhead to a double-headed arrow, drag the side or corner (depending on which handle you select) to enlarge or reduce the chart. Drag a side or corner handle of a selected chart to resize it. When the chart is properly sized and positioned in the worksheet, set the chart in place by deselecting it (simply click the mouse pointer in any cell outside the chart). As soon as you deselect the chart, the selection handles disappear, as does the Chart Tools contextual tab from the Ribbon. To re-select the chart later on to edit, size, or move it again, just click anywhere on the chart with the mouse pointer. The moment you do, the sizing handles return to the embedded chart and the Chart Tools contextual tab to the Ribbon.